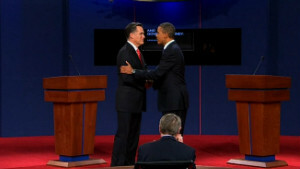 Did you miss the first presidential debate? You can watch the full event online on CNN.com. 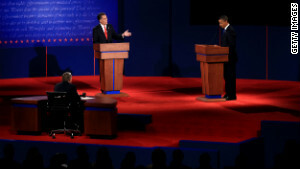 (CNN) -- A day after losing the first presidential debate to Mitt Romney, President Barack Obama and his campaign accused the Republican challenger of dishonesty over tax policy and other issues. "If you want to be president, you owe the American people the truth," Obama told a campaign rally Thursday in Denver in reference to the former Massachusetts governor, who is challenging him in next month's election. "So here's the truth: Governor Romney cannot pay for his $5 trillion tax plan without blowing up the deficit or sticking it to the middle class. That's the math." The president's top aides were even more blunt. "Romney's performance was one that's probably unprecedented in its dishonesty," senior adviser David Plouffe told reporters. 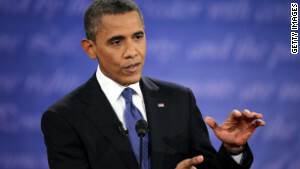 However, senior campaign adviser David Axelrod acknowledged that Obama would examine his debate strategy for the next two contests -- on October 16 in New York and October 22 in Florida. The president opted against "serial fact-checking with Governor Romney, which can be a never-ending, exhausting pursuit," Axelrod said. "Obviously, going forward, we're going to have to look at this and we're going to have make some adjustments." Meanwhile, Romney continued to push his debate theme of too much federal spending under Obama, complaining of "trickle-down government" that has failed to solve the nation's economic woes. "We have two very different courses for America -- trickle-down government or prosperity through freedom," Romney said in an unannounced visit Thursday to a conservative conference in Colorado. "And trickle-down government that the president proposes is one where he will raise taxes on small business, which will kill jobs. I instead want to keep taxes down on small business so we can create jobs." Romney will campaign later Thursday in Virginia, hoping to build momentum from the debate that analysts and a snap poll agreed was won by the Republican challenger. His supporters crowed about his performance, saying it reshaped a race that Romney had appeared in danger of losing. Sen. Rob Portman of Ohio, who played the role of Obama in debate rehearsals for Romney, said the GOP candidate had a "terrific night." "He did exactly what he had to do for the undecided voter in Ohio or around the country," Portman said. "They were looking for two things: One, a discussion of the last four years and why we can't afford it for the next four, I thought he explained that well. Most importantly, he talked about his own policies and he was able to set the record straight on some of the misleading ads the Obama campaign has put out there about his tax plan about his budget plan, about his health care ideas and so on." To Ed Gillespie, a senor adviser to Romney, the GOP challenger brought focus to the sharp contrast between the candidates by showing voters that "we can't afford four more years like the last four years." In exchanges full of policy proposals, facts and figures, Romney was more aggressive in the 90-minute encounter on Wednesday night at the University of Denver. A forceful Romney criticized Obama's record and depicted the president's vision as one of big government, while the Democratic incumbent defended his achievements and challenged his rival's prescriptions as unworkable. "A week ago, people were saying this was over. We've got a horse race," said CNN Senior Political Analyst David Gergen, who called the debate Romney's best so far after the 22 the former Massachusetts governor took part in during the GOP primary campaign. 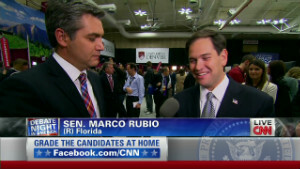 Alex Castellanos, a Republican strategist and CNN contributor, expressed surprise at Romney's strong performance, saying he "rose to the moment" and seemed to benefit from the multiple primary debates. "It looked like Romney wanted to be there and President Obama didn't want to be there," noted Democratic strategist and CNN contributor James Carville. "The president didn't bring his 'A' game." 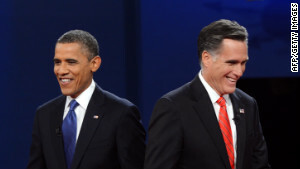 The CNN/ORC International poll of 430 people who watched the debate showed 67% thought Romney won, compared with 25% for Obama. Obama joked Thursday that a different Romney appeared at the debate from the conservative candidate who won a grueling Republican primary campaign to challenge him on November 6. "When I got on to the stage I met this very spirited fellow who claimed to be Mitt Romney," Obama said to laughter from the crowd of more than 12,000 at a Denver park. "But it couldn't have been Mitt Romney because the real Mitt Romney has been running around the country for the last year promising $5 trillion in tax cuts that favor the wealthy. The fellow on stage last night said he didn't know anything about that." At the Denver rally and a later event in Wisconsin, Obama also went after Romney's pledge during the debate to cut funding for public broadcasting, referring specifically to the popular Sesame Street character Big Bird. "He'll get rid of regulations on Wall Street, but he's going to crack down on Sesame Street," Obama joked about Romney's pledge to repeal the Dodd-Frank Act that reforms the financial sector. "Thank goodness somebody is finally getting tough on Big Bird," Obama added. "It's about time. We didn't know that Big Bird was driving the federal deficit." Romney's strongest moments came in emphasizing his frequent criticism of Obama's record, saying the nation's high unemployment and sluggish economic recovery showed the president's policies haven't worked. "There's no question in my mind if the president is re-elected, you'll continue to see a middle-class squeeze," Romney said, adding that another term for Obama also will mean the 2010 Affordable Care Act, known as Obamacare, "will be fully installed." "At some point, the American people have to ask themselves if the reason that Governor Romney is keeping all these plans secret is because they're too good," Obama said, adding the answer was "no" and that the lack of details reflected the difficulty in making touch decisions. In his strongest line of the night, Obama said Romney lacked the important leadership quality of being able to say "no" when necessary. "I've got to tell you, Governor Romney, when it comes to his own party during the course of this campaign, has not displayed that willingness to say no to some of the more extreme parts of his party," Obama said in reference to his challenger's swing to the right during the primaries to appeal to the GOP's conservative base. Romney rejected Obama's characterization of his tax plan, insisting it won't add to the deficit, and criticized the president's call to allow tax rates on income over $250,000 for families and $200,000 for individuals to return to higher 1990s rates as a job-snuffing tax hike on small business. "I just don't know how the president could have come into office, facing 23 million people out of work, rising unemployment, an economic crisis at the -- at the kitchen table, and spend his energy and passion for two years fighting for Obamacare instead of fighting for jobs for the American people," Romney said. 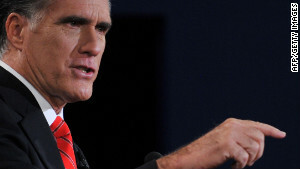 "The right answer is not to have the federal government take over health care," Romney added, quickly noting his plan would include popular provisions of Obamacare such as allowing children up to age 26 stay on family plans and preventing insurers from denying coverage for pre-existing conditions. In response, Obama said Romney's stance to have states craft their own health care plans would allow insurance companies to return to past practices that hurt consumers. On Thursday, Axelrod described Romney in the debate as a "serial evader" and "artful dodger" for avoiding specifics on tax loopholes and deductions he would eliminate or proposals to replace health care reforms and Wall Street reforms he promises to repeal. 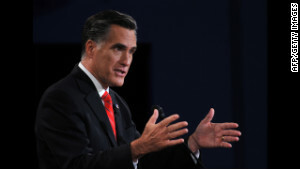 Romney came under similar criticism from opponents in the Republican primary campaign, with former House Speaker Newt Gingrich calling him a liar in January. 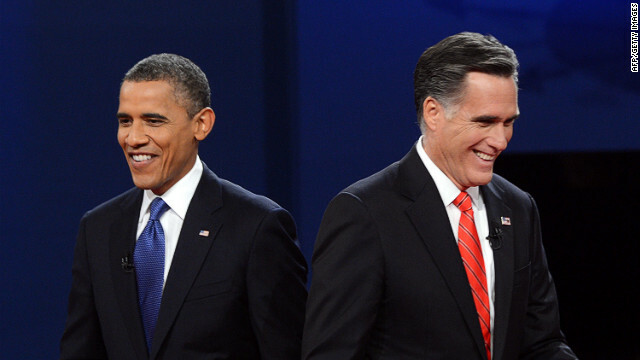 Before the debate, Romney warned that Obama would be untruthful, and he accused the president of dishonesty and distortion during Wednesday night's event. Whether it matters is itself a topic of debate. According to an analysis by Gallup, televised debates have affected the outcome of only two elections in the past half century -- Nixon-Kennedy in 1960 and Bush-Gore in 2000.